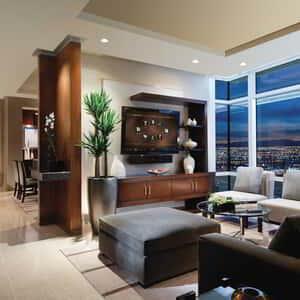 The MGM Resorts destinations in Las Vegas offer a variety of penthouse suites with an even larger array of VIP amenities. Each of our penthouse suites provides guests with an elegant respite from the hustle of the Las Vegas Strip complete with luxurious touches throughout the rooms. Plan your next vacation by exploring the best penthouses on The Strip. Prepare to indulge in luxury when you step into our one bedroom penthouse suite. Experience Las Vegas like never before with ARIA's signature one-touch control system. Heighten your vacation in this stunning suite with expansive, sweeping views of The Strip. Find the best penthouse suites in Las Vegas at MGM Resorts destinations. A unique assemblage of our foremost suite accommodations, previously available by invitation only, is now available to our most discerning guests. This is a collection of suites and villas unlike any in the world; for experiences that are unlike anything else on the planet. Welcome to a world of complete sophistication and escape. Together, it creates the kind of elevated experience that you’ll remember forever. Each suite offers a unique experience that is a getaway unto itself. Walk through the door...and be transported to another world. Relax in style with a solarium, indoor garden and fountain, fireplace, two master bedrooms, and a conference room. Boasting a luxury residential feel, enjoy all the comforts of home with the charm and elegance of a vacation escape. Enjoy unparalleled luxury through the lavish detail and personalized services of these two-story lofts atop MGM Grand. Find the most luxurious villas and suites in Las Vegas on The Strip. 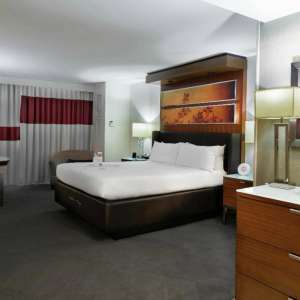 Put your best foot forward with your out-of-town friends & family by hosting a hospitality suite. Create a welcoming environment separate from your bedroom so that your party can stay together, no matter the occasion. The hospitality suites at MGM Resorts in Las Vegas are the perfect setting for guests planning a small business meeting or private gathering. Ideal for corporate retreats or meetings this suite has an abundance of space and the option of a one- or two-bedroom set-up. 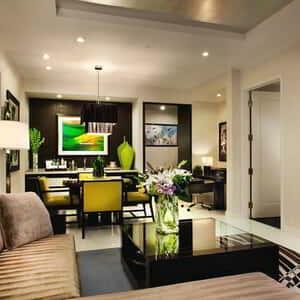 Delano Las Vegas signature suites include a tastefully crafted dog menu as well as a fully capable sitting service. This suite is just the right amount of business and pleasure with its impressive views, separate entertaining area, and kitchenette. Find the best hospitality suites in Las Vegas. The larger the group, the more important it is to stick together. 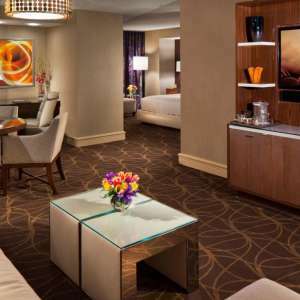 The two and three bedroom suites in Las Vegas are the perfect accommodations for larger parties, including groups of 8 or 10 people. 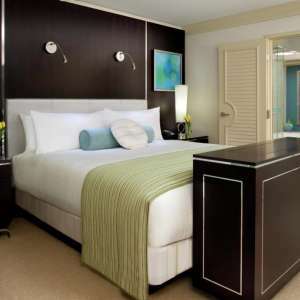 MGM Resorts destinations in Las Vegas have some extraordinary, larger accommodations that be the perfect basecamp for your next Las Vegas getaway. Make your Las Vegas suite dreams come true with a stay in the Two Bedroom Bellagio Suites. 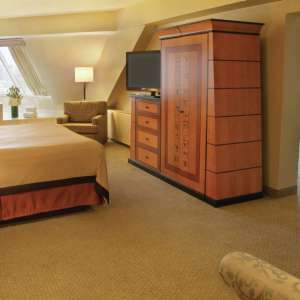 This suite includes a private balcony, two separate master bedrooms, and full kitchen. Live the suite life in this suite, complete with two bedrooms and a separate space to entertain. 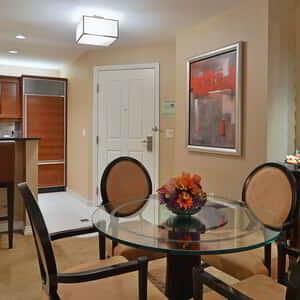 View all of the best 2 & 3 bedroom suites in Las Vegas on The Strip. When it comes to a Las Vegas vacation, choosing a suite with a view of The Strip can transform a fun vacation into an exciting memory. All of MGM Resorts suites in Las Vegas boast some remarkable views, but these suites guarantee you'll have a fantastic view of The Strip in all its wonder. Offering spectacular views of the iconic Fountains of Bellagio, you'll want nothing less than to pamper yourself in this luxurious suite. 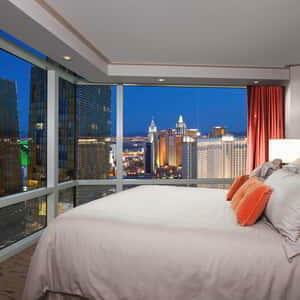 With panoramic views of The Strip this expansive suite may provide the most restful sleep you've ever had. Enjoy The Strip from above with this corner suite at MGM Grand. 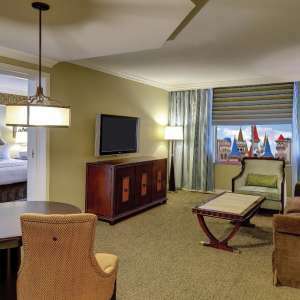 Find all Las Vegas suites that have resplendent views of The Strip, City, or Mountains. Upgrade your Las Vegas honeymoon with a suite at the MGM Resorts destinations up and down The Strip. Each suite is has unique, perfected touches for newlyweds. 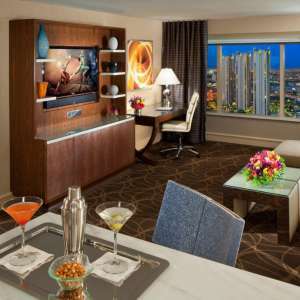 With expansive views of The Strip and Valley, you'll feel like a high roller in these romantic and decadent suites. 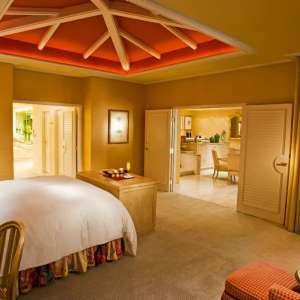 Stay tucked away from the hustle within this luxury suite; its large windows make for incredible views while you enjoy your honeymoon stay. When the festivities have ended and the honeymoon begins, the decadent, whirlpool spa tub will help you unwind. The slanted walls in this fun suite give you a true sense of life inside a pyramid while adjoining suites allow plenty of room if needed. View some of the best suites in Las Vegas to celebrate your honeymoon. Step away from the hustle of the city to relax in a Stay Well room or suite at MGM Resorts hotels. Stay Well infuses wellness in to your hotel room with features and programs that maximize your experience and minimize the impact that travel has on the human body; providing you with better rest, fresher air, personalized lighting and more. Get better rest with features that maximize your experience and minimize the impact that travel has on the human body. Make your stay everything you want it to be with the latest wellness technologies from Delos, the Cleveland Clinic and Dr. Deepak Chopra. Providing you with better rest and minimizing the impact travel has on your health. View all of the best rooms & suites to support your healthy lifestyle while on vacation.